You guys know I love social good items that I can incorporate into my daily life because I talk about them all of the time! By switching to these social good brands for everyday items, I can use my buying power, as a mom who makes much of the household purchases, to support causes that create worldwide change. I have bought several shirts and sweatshirts (and a print) from Sevenly when their cause resonated with me. For every item purchased, $7 goes to that current charity. They have raised almost $4.5 million to date and the clothing designs are always super cute. 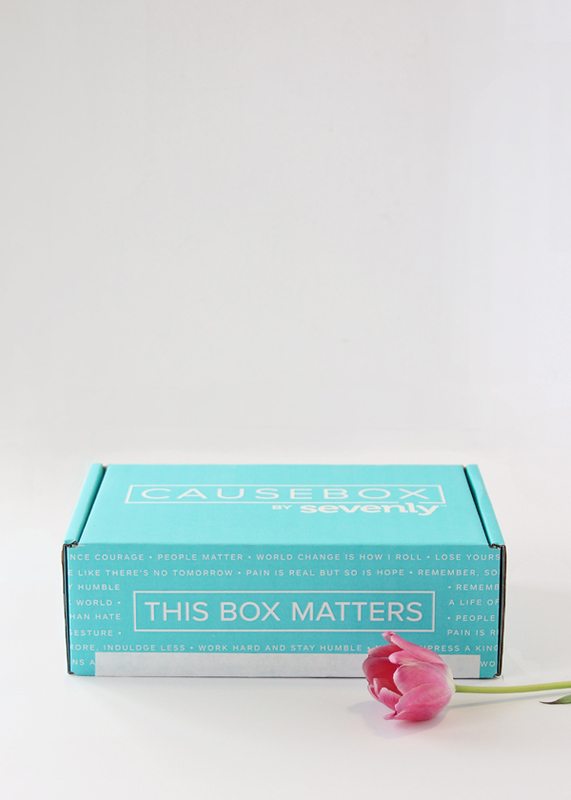 Sevenly recently started a quarterly subscription box full of socially conscious products for women called CAUSEBOX. Each season you will receive $150 worth of products from socially conscious brands that reflect Sevenly’s belief that People Matter. Plus, 7% of every box is given back to charity. 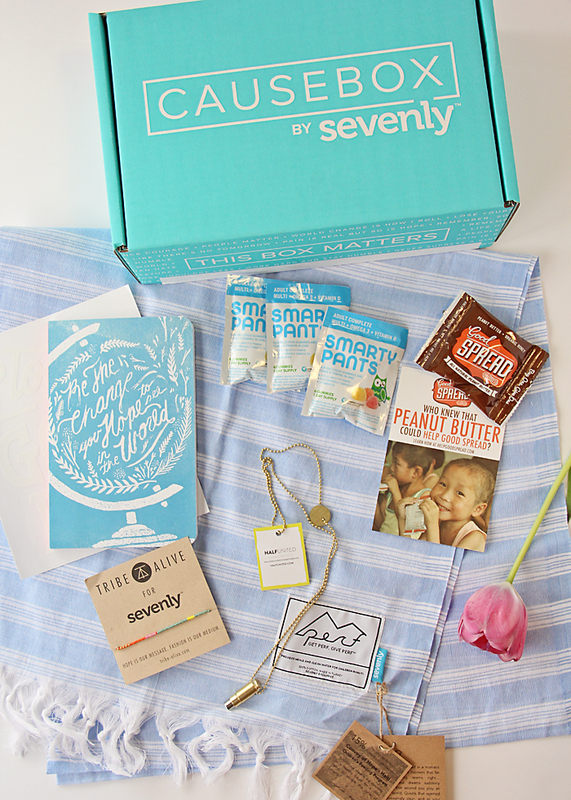 Everyone is into subscription boxes now and they are perfect for gifts, so why not choose a subscription box that creates world change? You can pay quarterly ($49.95) or annually ($199.80) for the CAUSEBOX. Every year you will at least receive $600 worth of socially conscious products. I love the fact that if there are a ton of quality products in each box and not just a few small samples like other subscription boxes. Subscribing allows you to be introduced to new social good companies and products and if you love them you can incorporate them into your daily life! (I now only buy Smarty Pants vitamins and Good Spread peanut butter). 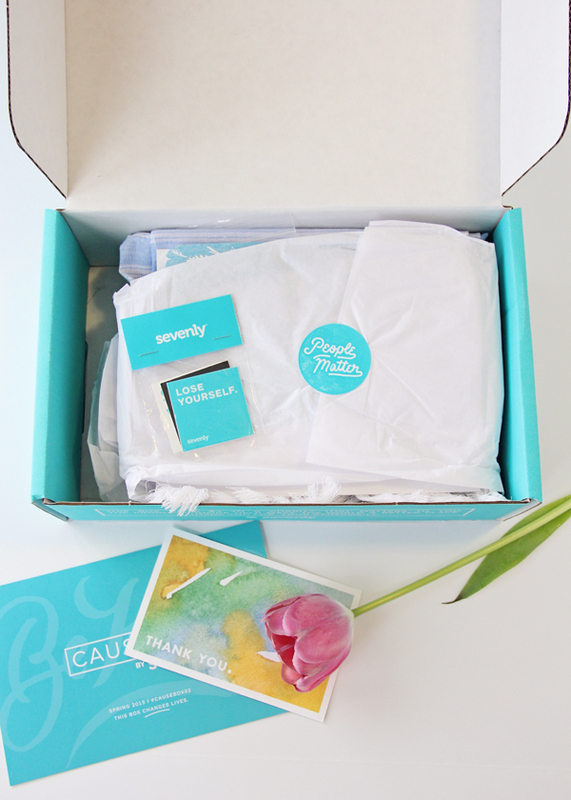 This Spring 2015 #CAUSEBOX02 was filled with so many items I am super excited about. Half United “Fighting Hunger” Necklace ($34) – Each “Fighting Hunger necklace incorporates three hand-polished recycled bullet casings to take a strong stance in the fight against hunger. Half United’s mission is to use fashion to provide aid for world hunger. They donate half of their profits from every product sold directly to global hunger relief efforts. Denik “Be The Change” Journal ($17.99) – A portion from every notebook that Denik sells goes toward funding schools in developing countries. Tribe Alive Bracelet ($35) – This super simple, yet chic beaded bracelet is exclusive to Sevenly! Every bracelet is handmade by women in Honduras under fair trade working conditions and each piece contributes to community development and job creation in developing countries. Perf Turkish Towel ($55) – Flat woven in Turkey, this towel is highly absorbent, fast-drying and great for easy packing. “Good Day” Sevenly Cling ($9.95) – A Sevenly original product that peels on and off windows easily. Smarty Pants Vitamins Travel Packets ($4.25) – Smarty Pants partners with Vitamin Angels to give vitamins to a child in need for every bottle they sell! Good Spread Peanut Butter and Honey Packet – When you buy this peanut butter, a malnourished child will receive the equivalent of therapeutic food. Head on over to the CAUSEBOX website to sign up for a subscription or send a subscription as a gift! This box changes lives. Thank you CAUSEBOX for sending me this box to share and spread the word!